Katzenthal - Site de vinsalfredmeyeren ! If the wine growing vocation of KATZENTHAL was in all likekihood started before the first millenium, local history states that from a the beginning of the 13th century, the remarkable wines of our village attracted many ecclesiastical owners. The location of the vineyard at the bottom of a valley enclosed on three sides ans sheltered from prevailing winds, creates a particularly favourable micro climate. The quality and diversity of the soils and the ideal exposure of its slopes, provide optimal conditions for producingexceptional wines. Today, around thirty wine growers operate 200 hectares of vineyards, combining tradition and progress. The castle overlooks the village and the vineyard of Katzenthal. 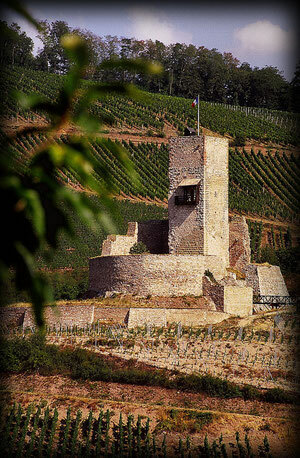 It is the only castle to be surrounded by vinyards and the famous Grand Cru »Wineck Schlossberg » is named after it. Built around 1200 by the count of Eghuisheim-Dabo, it is mentioned for the first timein 1251 when count Ulrich de Ferette givesn thecastle to the Bishop of Strasbourg. It was held as a sub-fief by the Knights of Wineck, partician family of Rathsamheusen who maintained it until 1828. Occupied for 250 years, the castle is mentianed as »demolished » in 1502. This witness of Alsace’s medieval history was restored in 1972 by the Friends of Wineck, a « Society for Restoration and Conservation of the Castle of Katzenthal » who rescued it from oblivion and saved it from destruction.